Wow, it’s been a while, hasn’t it? For the first time in many years I decided to take some time off this summer. We moved just outside of the city, and on top of that, my mom decided to make a move too, which kept us busy over here. What I thought was going to be a little R&R time this summer turned out to be some in-depth Bible study time. I’ve been preparing a new study which I’ll be announcing shortly. I’m getting the final details together here, but hope to announce the date of that study next week. I can’t tell you how excited I’ve been about this one! It’s so awesome, so interesting, and so in-depth. You’re going to love it, and we’re going to have fun! In the meantime, I wanted to share a guest post from my friend Ruth Schwenk and her husband Pat. They just released their newest book, For Better or For Kids: A Vow to Love Your Spouse With Kids in the House, (affil link) which helps couples find balance and build a God-centered marriage. Years ago, when Ruth and I were first married, we agreed that I would do the hard work of landscaping (digging beds, planting, and mulching). Ruth would do the tedious work of watering, weeding, and pruning. In hindsight, I had made a terrible agreement! With multiple family moves, landscaping the house was becoming more laborious. With kids, a perfect mulch bed was unrealistic. I grew tired of digging beds and planting bushes only to see my work ruined by baseballs, footprints, and squashed ferns. I became apathetic about the things that were growing around the house. I must admit, I had no idea what she was talking about. A rose bush missing? But it was clear we were going to buy a new rose bush. This meant I would be planting a new rose bush. Sold! Before unloading frozen fruit, toilet paper, and water bottles, we escorted our new rose bush to its desired place in the mulch bed. We placed it perfectly in relation to the other plants, where its new roots would grow deep and strong. That is, of course, assuming I remembered to plant the rose bush. Now I (Ruth) was doing my best not to nag Patrick about planting the bush. I would occasionally mention that the rose bush needed to be planted, but I really didn’t say much about it. After all, I figured it was hard to miss, sitting smack dab in the middle of our raised mulch bed in the front of the house. It was large and full of bright pink roses. It was a beauty! Whether Patrick completely forgot or was avoiding the task, I have no idea. Either way, the poor bush slowly died in the hot summer sun. One particularly hot summer day, weeks after our purchase, I was watering the bushes next to my dead, not-so- Knock-Out-anymore rose bush. Out of the corner of my eye I spotted what I thought for sure was a tiny bud. Although the entire bush was brown, with barely a leaf on it, that dead rose bush was alive! It was hanging on by a thread, just waiting for me to rescue it! I rushed into the backyard to tell Patrick. Judging from Ruth’s excitement, I (Patrick) thought maybe we won the lottery (even though we don’t play)! My enthusiasm over the news was less about the rose bush still being alive than it was about the opportunity to redeem myself. And I did. I immediately dropped what I was doing and planted the bush. Would you believe it? That bush came back to life! Today it is still flourishing with all the beauty that first drew Ruth to it. Often, when watering our rose bush, I am reminded of how even small things can come between a couple. Marriage is full of failures. Some failures are big, but most are small. Something as small and insignificant as a rose bush can be a source of conflict in a marriage without grace. A graceless marriage doesn’t make room for mistakes. It is a crowded space, where there is little room to breathe. Where there is no place for error, the relationship suffocates. If you are like us, learning to walk in grace is toughest when we have kids in the house. But this is also one of the most important seasons in life to extend grace toward each other. Every relationship needs grace—lots of it. Without grace, no relationship would ever make it. Grace is a gift God extends to us so that we can be in relationship with him. When it comes to our relationship with God, we are the needy ones. We are sinners unable to remedy our situation on our own. So by grace God moves toward us. He takes the first step. God, in Jesus, forgives us of our sins. His grace brings us life when we need it most. Through faith, we can receive this unmerited move of God’s love toward us. If we are to be like Christ in marriage, we must move toward each other in grace. Grace brings life into our relationship and helps to sustain a marriage through its difficult seasons. Grace enables us to live out the missing vow to keep our love alive with kids in the house. Grace enables us to recognize each other’s needs and to respond with love—a love that relieves and revives. Patrick Schwenk is a husband, father, and pastor. Ruth Schwenk is a wife, mom, and blogger. She and her husband are the creators of FortheFamily.org and TheBetterMom.com. Patrick and Ruth have been married for more than seventeen years, have four children, and have been in full-time ministry for over fifteen years. Their first book together, For Better or For Kids: A Vow to Love Your Spouse with Kids in the House just released! 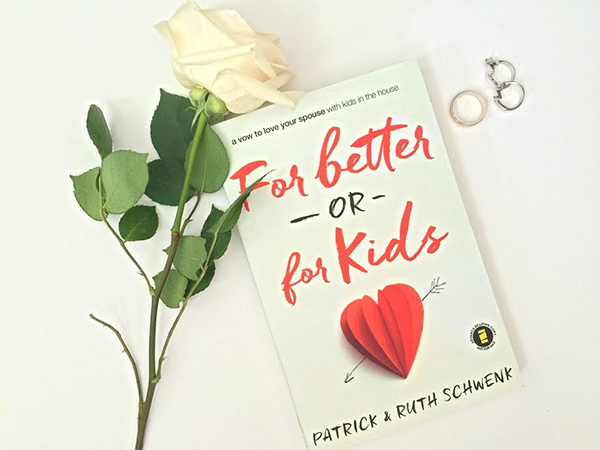 For Better or For Kids is a book packed full of our personal stories of marriage and parenting over the last 18 years, practical help and biblical wisdom that will enable you to have a loving and intimate marriage regardless of the season of life you find yourself in. Grab your copy today at Amazon, Barnes & Noble, Christianbook or anywhere books are sold. Thank you for this encouragement! Grace is definitely something that I have trouble extending, to anyone myself included. You talk about the importance of giving grace, but not about how to do it. Do you have any practical tips for extending grace to your spouse? Your next bible study sounds good! We need more joy.